10/20/1899: 1899 was a major turning point for Homestead! 1/21: “Last evening the lady members of the Homestead Library Athletic Club were pleasant surprised by Misses Alice Hirth, Mary McCann, Mame Evans, Elva Armstrong and Rose Skirball, members of the Junior H.L.A.C.” The banquet was in honor of the ladies’ basketball team recent victory over Braddock (the town’s main athletic rival). The musical and literary program after dinner concluded with a recitation by Rose. May 8, 1899: Hijinks ensued when Morris Markowitz‘s bike was stolen. Click to zoom. 5/8: “Morris Markowitz, a young man who is employed by his uncle, Sam Markowitz now knows what it is to be up against it. Morris mode his bicycle down to the Eureka Hotel” — Max Klein‘s place! — “about 11 o’clock Saturday night, and left it standing out in front while he went inside. James J. Ward, a bricklayer who boards at the hotel, came along and mounting the wheel rode off with it…” Morris chased down Ward, pulled him off the bike, and then Ward beat him up. “Morris got up as best he could, and mounting his re-captured wheel rode to his uncle’s butcher shop and told him of his troubles. Uncle Sam was on the warpath in a minute and off to Justice Giles’ home he ran and routed the justice out of bed.” It took a late night chase around town to track down Ward and serve him the warrant. Read the whole article — it is awesome. 7/11: “Morris Moss has resigned his position as salesman in McCune & Swartz department store to accept a position in Bott’s drug store on Dickson street, he having decided to become a druggist.” Not to spoil the end of this man’s story, but he would become well-known in Homestead as Dr. M.H. Moss. As you’ll see, many of these listings concern new stores opening in Homestead. There were many such notices in the paper throughout 1899; I selected only those concerning members of our community. A couple I weren’t sure of were Samuel Samuel’s “The New Bon-Ton” (9/12) and Samuel Markle’s “Philadelphia Bargarin Store” (8/28). 3/7: “WANTED–Girls to learn millinery. Only those intending to learn the business thoroughly, need apply. 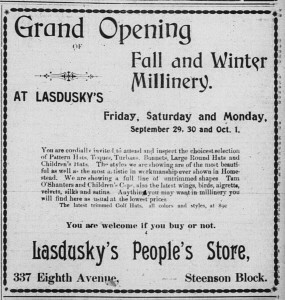 Lasdusky‘s People’s store, Eighth avenue.” Nevertheless, his millinery opening came off on time at the end of March. The first day of the three-day “Grand Spring Opening” was both Shabbat and Erev Pesach, and the second day was Monday, the second of day of Passover, which is traditionally observed as a full holiday. I noticed that the bi-annual millinery openings often coincided with Passover and Rosh Hashana, but as per the norm, the men worked. Fortunately, this years’ fall millinery opening took after after all of the fall holidays concluded. 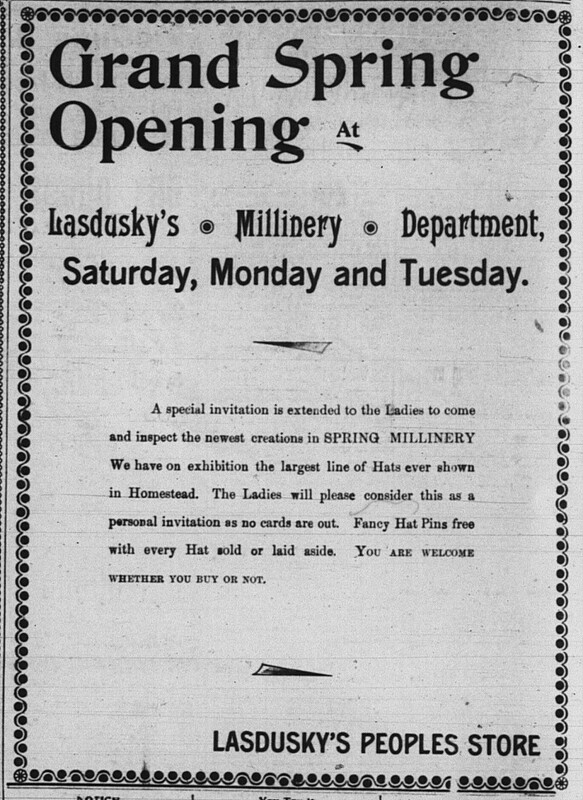 March 24, 1899: Ad for Lasdusky‘s Grand Spring Opening. 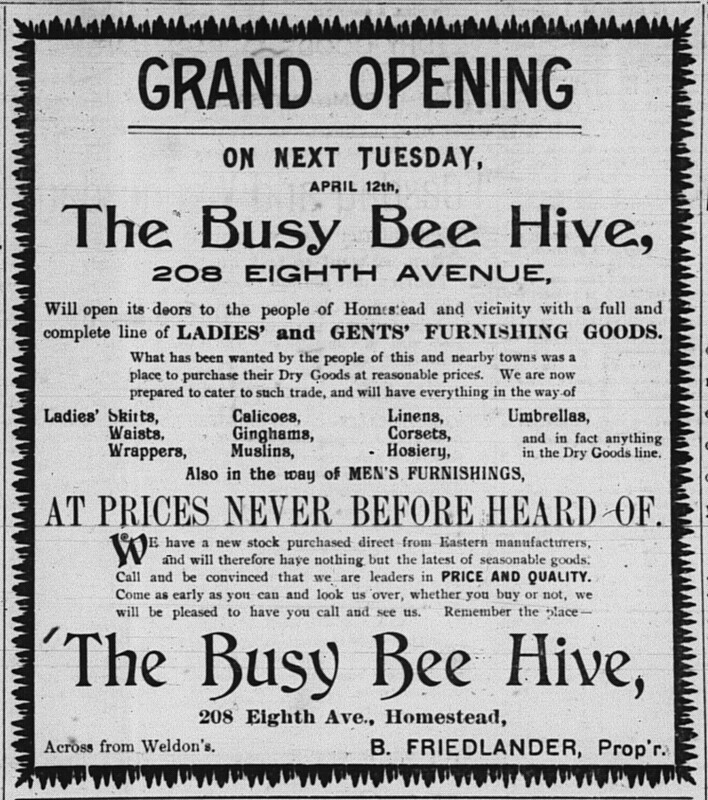 4/8: The first ad appeared for the grand opening of The Busy Bee Hive, a store selling “ladies’ and gents’ furnishing goods” on 208 Eighth Avenue on Tuesday, 4/12. The proprietor? Benjamin Friedlander! 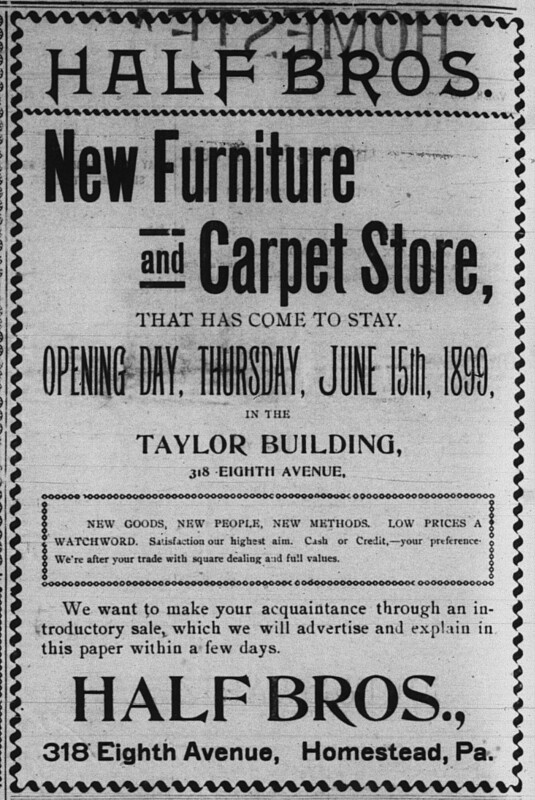 April 8, 1899: First ad for Benjamin Friedlander‘s store! 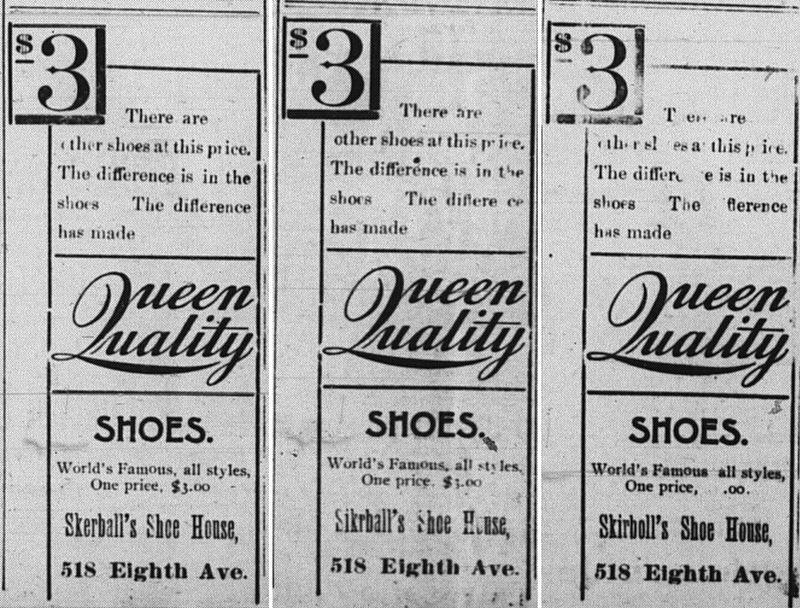 4/14: The first ad appeared for Wolk‘s shoe store. Though Jewish, he never became a member of the synagogue. 4/25: “I. Grossman is now in his new quarters, with a store facing on Eighth avenue and another facing on Ammon street. He handles a complete line of Gent’s Clothing, Furnishings and Shoes.” They meant I.S. Grossman, whose store address did change at this time to this location. 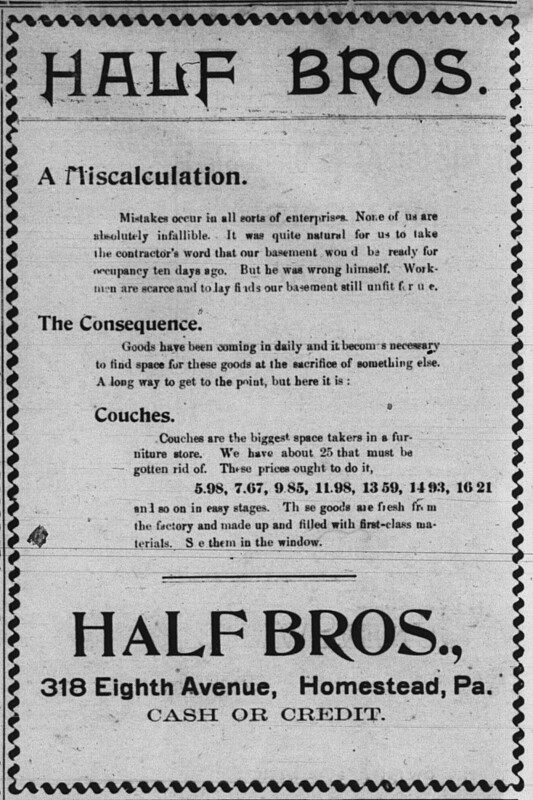 6/11: This date brought the first of many advertisements announcing the opening of another prominent store in Homestead, Half Brothers, managed by a German-Jewish family who resided in Pittsburgh and belonged to the Reform synagogue Rodef Shalom. 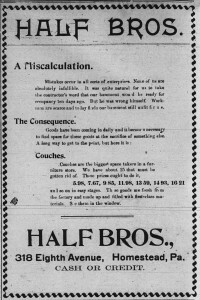 June 12, 1899: An advertisement for the upcoming opening of Half Bros., which quickly became the leading furniture store in Homestead. 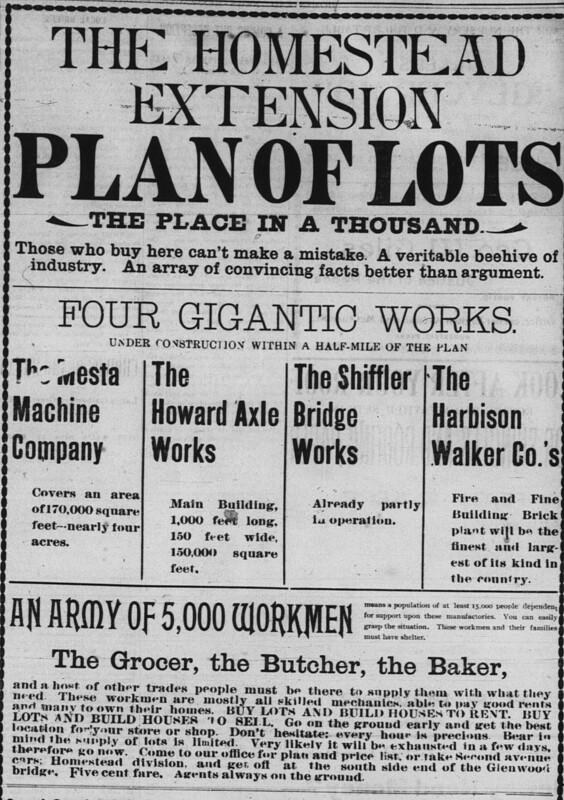 6/21/1899: A hilarious Half Brothers’ ad about contractor problems. 7/22: An advertisement appeared for “Skirboll Men’s Furnishers” at 521 Eighth Avenue (vs. the long-established Skirboll’s Shoe House, 515 Eighth Avenue). It appears he opened a second business at some point. 8/22: “Mr. A. Marcus, of Connellsville, has rented the storeroom at 264 Sixth avenue, next door to the Victoria hotel, and will open up next week init with a full line of gents’ furnish goods, bots, shoes, etc.” This is the father of Jacob Rader Marcus, the father of American Jewish history and one of most famous members of our community! 8/28: The paper announced a new firm, S. Markle & Co., also known as the Philadelphia Bargain Store. It was a great holiday season for all these stores, new and old. 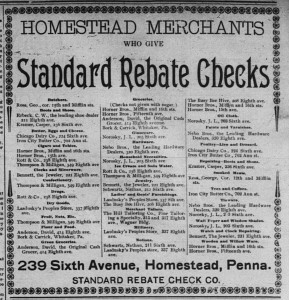 On 12/19 the paper boasted, “Homestead merchants are offering a large and more varied line of holiday goods than ever before.” There was a ton of advertising in the paper, including from most of the prominent Jewish merchants. On the day after Xmas, the paper summarized of the weekend preceding Xmas, “Saturday the stores did a phenomenal business and the merchants are more than satisfied with their returns from the holiday trade. One of the largest firms of the town report their business for the ten days preceding Christmas was 50 percent greater than in former years, and other reports gains in like proportion.” On 12/21, of the 29 stores singled out for their Xmas displays, the ones from the Jewish community were Segelman‘s Jewelery (sic) store, Lasduskey‘s (sic) Peoples store, Grossman‘s Toy store, Grossman‘s Clothing store, Grienburg (sic) Bros’ Toy store, Skirboll‘s Shoe store, Phil Coen (sic) the Tailor and Gents Furnisher, and Half Bros. Furniture store. There are plenty of woes listed below, but one which is not is in-fighting. On 10/26 the paper reported cryptically that Jewish grocers in Duquesne were “warring with each other,” but the paper never reported anything of the sort about Homestead’s local Jewish community. 6/1: “Claims To Have Lost $250. M. Eskowitz, who runs a store in the Healey block on Dickson street claims he lost a pocket book containing $250 and his bank book yesterday. He went before Justice G.W. Giles and had a search warrant issued to search the house over his store, but no trace of the missing pocket book could be found. There seems to be a mystry (sic) connected with the case.” I believe this concerns Nathan Eskovitz. 6/5: Oh dear, my great-grandfather’s brother, Adolph Hepps, was up to no good. To be fair, garbage dumping was an ongoing problem in Homestead, because they had no proper dump or incinerator as they should have! A week later, people were arrested for dumping garbage on railroad grounds, including a little girl who was just shaking out a table cloth! This was a hot-button political issue on and off over the years. In the Park–He Sent a Boy up With a Wagon Load About 0 O’clock Saturday Night–A Citizen Frightened the Lad Who Ran Away and Left the Wagon Standing in the Park. About 9 o’clock Saturday night Harry Maiden, who resides near the park saw a boy drive up and start to dump a wagon load of garbage down into the hollow. Maiden hollowed (sic) at the lad, who became frightened and ran away, leaving the wagon standing in the park. Maiden got in a drove the wagon down to Justice Giles office and turned it over to Health Officer Donaldson. The boy who had been driving the weagon appeared a little later and said it belonged to Adolph Hips, who runs a butcher shop at the corner of Fifth avenue and Dickson street. Health Officer Donaldson went down and arrested Hips, who plead ignorance of the law. Justice Giles said that would not excuse him and he then plead guilty and was fined $10 and costs. The boldness of the robbery committed at Philip Cohn’s store on Eighth avenue last Saturday night is worrying the police not a little, as they are unable to get any clew (sic) to the robbery. About 4 o’clock in the morning Mr. and Mrs. Cohn heard the crash of breaking glass and got up and looked out as quickly as possible, but could see no one. An investigation followed and it was found that the front window had been broken at three rolls of pants patterns and two rolls of suit patterns valued at $30 were missing. Nothing else in the window was disturbed. 5/6: “Mrs. Annie Lasdusky, of Scottdale, is the guest of Mr. and Mrs. Joseph Lasdusky of Seventh avenue.” In town for the bris? 5/22: In case you ever wondered how these families immigrated piecemeal and somehow found each other in a land where the new arrivals didn’t speak the language, here is a cautionary tale that it doesn’t always work out. Headlines below, but click to read the whole article. May 22, 1899: The harrowing saga of how Fanny Markowitz, only 13, disappeared in NYC after arriving in the US. Click to zoom. A Thirteen Year Old Member of His Family Arrived in New York Last Wednesday From Hungary and After Telegraphing to Her Brother for Money Disappeared–After Much Worry and Many Messages She was Located in the Metropolis Yesterday and is due Here To-Day. 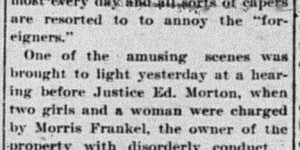 8/18: Perhaps this is the same Bettie Kline from the 1894 liquor arrests? The testimony was filed in the county courts yesterday in the case of Betty Kline against Joseph Kline, of Homestead, in which desertion is alleged. It is asserted that while Mrs. Kline was ill her husband sold out his business, pocketed the proceeds and left after telling some of his acquaintances that he thought his wife was big and strong enough to earn her own living. 8/25: “M. Rubenstein, the Eighth avenue confectioner fell from his wheel while on his way to McKeesport, one evening this week and was badly cut and bruised about the face. He was attended by Dr. Casssett, who was obliged to put two stitches in the side of his face.” To be fair, I don’t have any corroborating sources that he was Jewish, though the name and profession suggest it. 9/8: “Mrs. A Skirboll, of Eighth avenue visited friends at Jeannette yesterday” — yesterday being the day after Rosh Hashana (traditionally a fast day, Tsom Gedaliah). 9/19: “David Skirboll, of Eighth avenue, visited Braddock friends last evening” — last evening being the first evening of Sukkot. 10/5: “Mr. A. Skirboll, of Eighth avenue, returned yesterday from New York where he went to attend the Dewey celebration” for Admiral George Dewey, the recently-returned hero of the recent Spanish-American War. On 10/10 the paper announced the man himself might come to Homestead during his upcoming trip to Pittsburgh. 11/25: “A marriage license has been issued to Reuben Schermer, of Pittsburg, and Bertha Klein, of this place.” After the wedding the couple settled in Homestead where Schermer became active in the Jewish community. 12/2: “I.S. Grossman is on the sick list.” This is terrible timing with the important holiday shopping season in full swing. And then an accident befell his store manager! One of the big surprises to me, which began to emerge in earnest as I read through the paper from this year, is how many of the Jewish community invested in local real estate and became landlords as a side-operation to the store for which they were best known. Being a landlord in turn-of-the-last-century Homestead doesn’t seem like it was a lot of fun, though. 8/5: A local firm sold over $50K property during past 10 days. “The largest sale reported, and in fact one of the largest made in the town for some time, was the sale of the Cox block at the corner of City Farm Lane and Fifth avenue. The property was owned by John F. Cox Esq., and was sold to Morris Frankle of Heisel street. Sixteen families reside in the block.” Because of what ensued in early October, I infer that the families were given two months to move out. With the extremely tight housing market in Homestead, four could not — or would not — find new homes. Shortly you’ll see how that situation resolved itself. 8/17: “The deed was recorded conveying from Levi Myers to M. Markowitz of Pittsburg, a lot 40×119 feet on Third avenue, for $19,000. His property is in the business center of the town, and is improved with a large three-story brick building.” Although it says he is from Pittsburgh, I looked at the original deed — this is definitely our Max Markowitz. Levi Myers was a liquor dealer in Homestead in the early 1890s. There is circumstantial evidence to suggest he was a German Jew. 10/13: Four families were evicted from Cox’s row, the property recently bought by Morris Frankel. One of the evicted women was a repeat-offender of the speakeasy law; she left calmly. The others refused to go and a major confrontation with the officers ensued. “The people all say that they were willing and anxious to move just as soon as they could get a house but that they thought it an outrage that they should be turned out into the street with no place to go.” Read the whole article in the slideshow below. 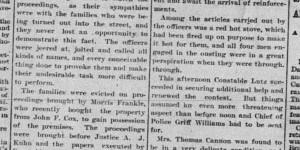 10/17: The papers reports that the families who were evicted moved back in after the officers left. 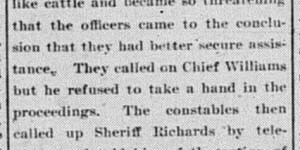 The confrontation was even more heated than last time; townspeople through stones at the officers. The article revealed that a second of the women involved was also frequently in violation of the liquor laws and was planning to leave town altogether. This article doesn’t mention Frankel at all; one wonders whether the angry townspeople were aware the offending landlord was Jewish. Read the whole article, also in the slideshow below.It’s important to note that this area was pretty rough. Just opposite the mill, it was a poor part of town where articles reported constant unrest amongst the large immigrant population. 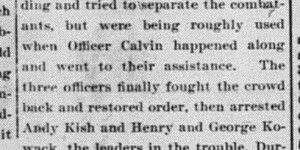 For example, there was a riot at Frankle’s Cox’s row after a Slavish wedding, as reported on 10/31. 11/14: Frankel wasn’t the only troubled landlord, however. 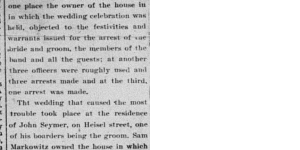 On this day the paper reported that landlord Sam Markowitz had forbade a wedding of his tenants in his house since the dancing would damage the house. Nevertheless the wedding took place, and since Markowitz could not get the dancing to stop, he had his tenant arrested. After the tenant returned from court, he re-started the party, which damaged the house. More officers tried to arrest the guests but were scared off. Eventually the violinist was forced to leave, and so the party soon died down. This property of Markowitz’s was just a block over from Frankel’s troubled Cox’s row. The full article is in the slideshow below. 11/15: The very next day the paper provided another update about what was going on in Frankel‘s property. The new residents were “Slavs and Huns” who replaced the native-born former residents, some of whom threw dough at the new residents. This article is also in the slideshow below. 11/23: And just a week before I.S. Grossman came down with typhod fever (see above), a house he leased was gutted by fire. Because the fire alarm system did not work properly, the house was nearly entirely gutted, causing him $500 damage (though he had insurance). This article and a follow-up about the fire alarm system are the last in the slideshow below. 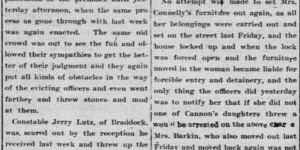 10/17/1899: The second article in the Frankle eviction saga. 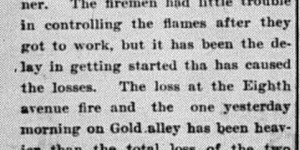 11/23/1899: A terrible fire guts a house I.S. Grossman rented out. 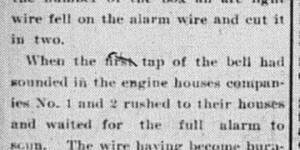 11/24/1899: A malfunction in the town’s fire alarm system is why the fire caused such damage. 3/1: Retail liquor license applicants included Henry Moskovitz, 214, 216 and 218 Dickson street and Max Klein, 110 and 112 Fifth avenue. 4/15: The paper reported that Klein got a license, but Moskowitz did not. 10/31: Mike Weise, a local merchant and Grinberg brother-in-law, got himself into some trouble by violating the blue laws by selling a beverage that no one was quite sure whether or not it was alcoholic! That is the Charge Made Against Mike Weise. Chief of Police Griff Williams Made the Arrest and Justice Ed. Morton Imposed a Fine. Mike Weise, who keeps a little fruit and confectionary store on the upper end of Eighth avenue, was charged before Justice Ed Morton yesterday with selling on Sunday. The information was made by Chief of Police Griff Williams, who also made the arrest. Chief Williams alleged that Weise sold ambrosia, but he was not able to explain just what ambrosia was and therefore simply charge Weise with violating the old blue laws by selling on Sunday. Ambrosia is alleged to be a beverage which looks like beer, but that is all the experts can say about it. Several complaints have been made to Chief Williams about Weise dispensing this beverage on Sunday, and the Chief decided to put a stop to it and to be on the safe side brought the above charge. Justice Morton fined Weise $3 and costs which he cheerfully paid. 5/10: “Herman Goldstone, a picture agent, was arrested yesterday by Chief Williams and Officer Serr, for soliciting without a license. He left a picture and $3 with Justice Morton for his appearance for a hearing.” Is he connected to I.J. Goldston, a local merchant? Morris Blier, son of Mr. Blier, of McKeesport, was done up by a Second ward boy yesterday in great shape. He was completely covered with blood whe his father brought him up to Justice G.W. Giles office, and looked as though a cyclone had struck him. The boy said another boy about his own age had pulled him from his father’s wagon and knocked him down and beat him, at the request of a third boy whom he caught stealing bottles from the wagon some time ago. A warrant was sworn out for the arrest of the boy who committed the assault, but as all Second ward boys look alike, Constable Frank Bell was unable to locate the right one. The Hebrew day of Atonement and fasting known as ‘Yom Kippur’ was observed yesterday by the Hebrews throughout the world. There were services in the synagogue here and in Braddock, and it is said prayers were offered up for Captain Dreyfus, petitioning that justice and freedom be given him. Next Monday the feast of the Tabernacles in the Hebrew churches will begin last six days. It is a week of pleasure. 10/7: Perhaps the idea for creating this group sprang out of the community gathering for the holidays, which concluded on 9/27? A young men’s Jewish club is being organized in Homestead. One meeting has already been held and the promoters of the organization have met with much encouragement. Another meeting will be held tomorrow evening to complete the organization. The club will be purely social in its objects and gives promise of being a credit to the town. 3/24: The Homestead paper reprinted an article from the Dallas news that began, “Judah P. Benjamin was the first Jew elected to a seat in the America Senate, and the contest was a notable one. A representative who was “a great admirer of Benjamin” wanted to break the tie to elect him. He was “placed on a cot, carried to the House of Representatives and when his name was called he voted for Judah P. Benjamin for United States Senator. Amid great excitement and the wildest sort of applause Benjamin was declared elected.” The representative survived his illness. 6/22: A poem about current events we still remember well: “Dreyfus gets a vindication. / This is gratifying, yet, / To enhance the world’s elation, / What does Esterhazy get?” It’s a little unclear why the optimistic perspective; though Dreyfus was now considered not guilty and arrived back in France around this time, he was immediately locked up again to await a new trial. On September 9, Shabbat Shuva, the Sabbath between Rosh Hashana and Yom Kippur, “Dreyfus was convicted of treason but “with extenuating circumstances” (by 5 votes against 2) and sentenced to ten years’ imprisonment and a further degradation.” At Yom Kippur, as indicated above, his fellow Jews prayed for him as he appealed for a retrial, but shortly thereafter he accepted guilt and on 9/19 he was pardoned, not found innocent. On 9/21 he finally returned to his family. 11/18: “Mark Twain on the Jews,” read a headline in this days’s paper, followed by the subhed, “The Famous Humorist Has a Deservedly High Opinion of the Children of Israel. What followed was an excerpt from Twain’s essay “Concerning the Jews,” the section beginning after Point No. 1 and running to the semicolon at the bottom of p. 175. 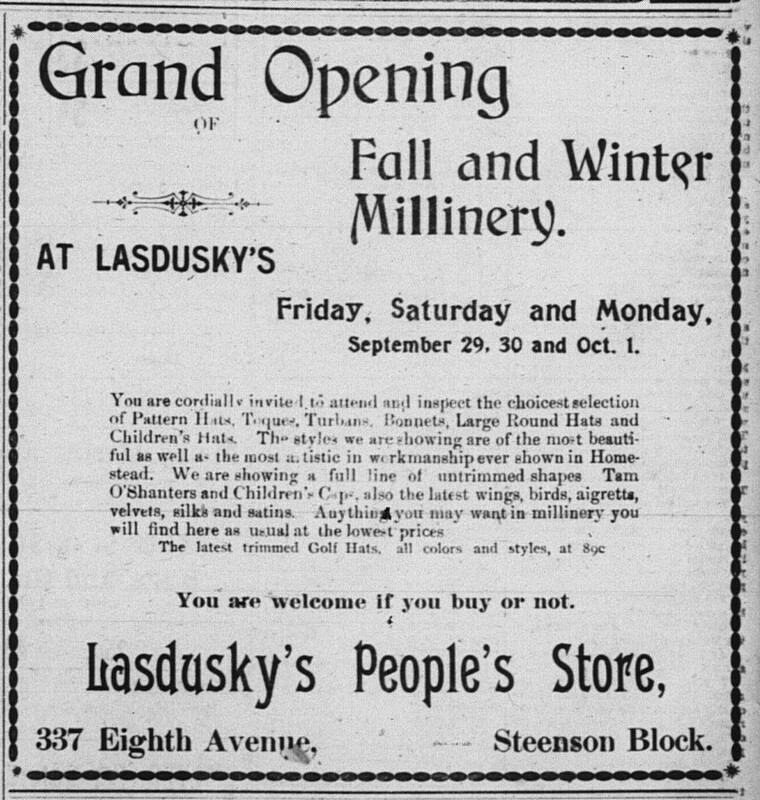 9/29/1899: Lasdusky‘s second fall millinery opening. 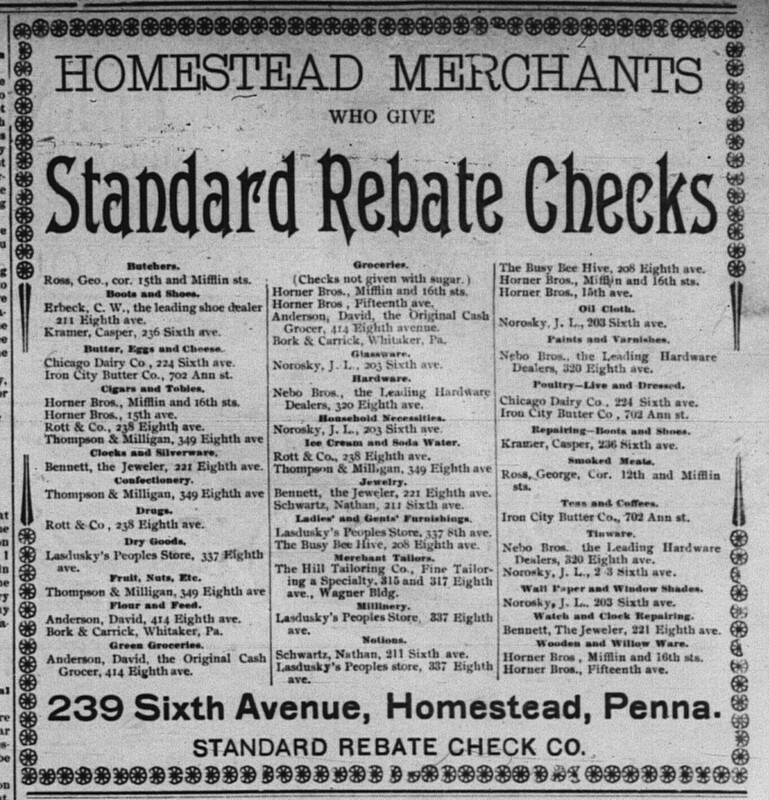 7/7/1899: Standard Rebate Checks were all the rage. 7/5: “Gents and Ladies’ furnishing goods, go to Nathan Schwartz, 211 Sixth avenue, and he will give Standard Rebate checks—ask for them.” There were made ads for these “Standard Rebate checks” — not entirely sure what they were, though the papers in the years featured lots of advertisements for things which seemed to be early versions of coupons or coupon books (all of which the paper frowned upon). 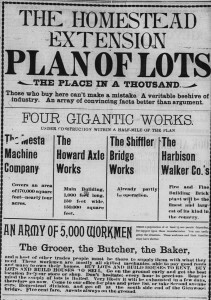 9/20, 9/21, 9/23/1899: It took three tries to spell Skirboll‘s name right in this ad.